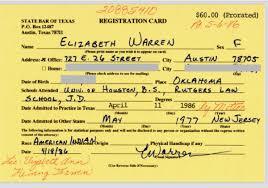 The revelation, initially reported by The Washington Post, is the first known instance of Warren claiming Native American ancestry in an official document or in her own handwriting. Comment: 2nd article has the interesting timeline. I had intended to have a blog post on each of the announced but have fallen hopelessly behind. I wonder how many other documents are publicly available where Warren made the same, false, claim. If indeed there are a few, maybe it's time for conservatives to start playing hardball on this. Either that, or who leaked a theoretically confidential application?